In the beginning it was fine but the speed gauge stopped working. Called customer service and was basically told sorry for your luck. So to me the $125 i spent was wasted money. Lesson Learned!!!! Works for me. Increased my swing speed from 95 to 110. Even if I'm only getting 105 on the golf course it's still an improvement. I'm 65 and have been losing distance for the last five years. Now I've got some of that lost distance back. Working with the speed stick has told me by instant feedback what works and what doesn't work in my swing. Need help on release or what? red and blue. When I bought the Red I could NOT swing 100mph. After 2 years I swing both the Red and Blue 110-115., And sometimes 120mph. But here is the problem, I was hitting my 7 iron 140-145, and my driver 235. I still can't hit any farther. The release of the club(s) is not the same or I must be doing something wrong. If you read the above review, you will see I have a problem. I let 2, 300 yard golfers swing them and they average 125. So how come I swing 5-10 mph slower,but hit the driver for example 65 yards shorter? And they both hit their 7 iron 175-185! The only thing I get is stretching. My turn is about 120 degrees. Ps: I have hit racketballs (serve) over 140 mph back when I played Pro Rb. I am 63 years old and used to hit the driver 200-210 yards. Swing speed was 85 mph. Started practicing with speed stik got speed up to 100 mph. Bur starting spraying ball left, right, and everywhere. Was moving my body. Started hitting plastic balls with it. This gave me the control and more consistent sweet spot hits. Now I average 240 to 260 and 10 out of 14 fairways. Average one round per week and practice 30 minutes 3 times per week. The biggest problem with the SpeedStick is that it encourages you to swing a heavy club faster than you normally do. Why is that bad? Because you can injure yourself doing it. So I'm giving it 2 stars. I would rather have them sell just the speed indicator that I could attach to a regular club. Swinging a weighted club is fine, but swinging it as fast as you possibly can, can lead to injury. 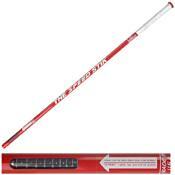 The speed stik is a solid product to use to not only improve your swing speed but your swing plane as well. One ONLY negative is the large diameter of the grip(1 inch).Iv'e also heard complaints that the swing speed indicator is not accurate, but who cares? If you can improve and make it go up, thats ALL that matters. The speed stik WILL improve your game MUCH better and faster than a weighted club-so stick with the speed stik(just 7 min per day) and youll see results in the long run. Bought a used one on eBay for $60. No DVD but went to the site and DL'd printable instructions. Following the routine religiously, mostly two sessions a day, I have increased my swing speed 10 miles per hour in less then two weeks. Have not played for a week, so more about later results on the course. A big plus to this product is the program of exercises and the ability to record speed and improvement. I am tracking my results on a spreadsheet, as suggested in the instructions.